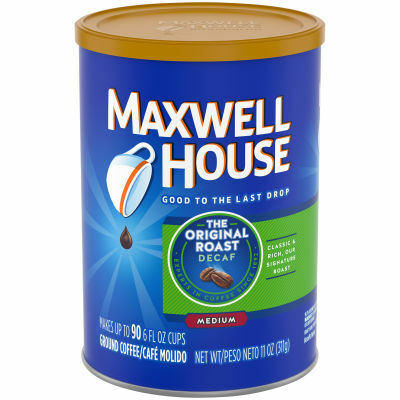 Decaf Original Medium Roast Ground Coffee Enjoy the classically rich taste of Maxwell House's signature blend, but without the caffeine. This decaf coffee is a premium quality blend of Arabica and Robusta beans, naturally decaffeinated to offer up the same great taste and aroma as a traditional medium roast. Good to the Last Drop Revitalize your senses and refresh your mind with this smooth blend of medium roast decaf coffee, perfectly packed into a resealable 11 oz. canister for optimal freshness and flavor. Perfect for use in all coffee makers, this package makes up to 90 cups of coffee that can be enjoyed any time of day.